No list of top schools offering quality ABA graduate degrees is quite complete without including universities that offer doctorate programs. Sure, a master’s is the generally accepted standard to practice as an applied behavior analyst (not to mention the standard path to earning BCBA certification), but more and more ABAs with sights set on contributing research and establishing independent practices of their own are going for their doctorate (a distinction that would qualify you for the highly esteemed BCBA-D certification, we should add). 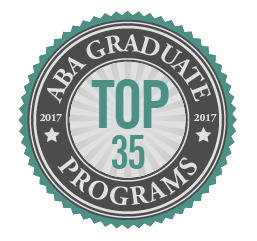 So how did we approach the task of deciding which ABA graduate programs would make the list? Simple really – we considered the things we know to be most important to people looking to take the most efficient path to career preparation or advancement. We know anybody weighing graduate program options is asking the same two questions: ‘How long will it take?’ and ‘How much will it cost?’ … And as it turns out, the answers to these questions are more closely related than you might think: It’s all about the courses. A master’s or even a doctorate alone isn’t enough to make sure you’re going to quality for the BCBA or BCBA-D certification you’re after. If the program hasn’t been pre-approved through the Behavior Analyst Certification Board (BACB) as including the right mix of courses, at best you’ll need to submit your transcripts for review and after some tense weeks of waiting find out you made the cut… At worst, you’ll learn that some of the course content you needed wasn’t covered, giving you no other choice but to go through the costly and time consuming process of enrolling in a post-master’s certificate program with a Verified Course Sequence. The solution? Simply select a master’s or doctorate program that already includes a BACB Verified Course Sequence (VCS) and save yourself some stress. Since all the programs on our list are ABAI-BAAB-accredited, they’ve already received the BACB’s stamp of approval. Not only is the course sequence these programs offer BACB-approved, they have also met other rigorous standards for accreditation enforced by the Behavior Analysis Accreditation Board of ABAI. Whether you’re interested in studying ABA at the master’s or doctoral level, we hope the information we’ve gathered will help you narrow down your options and find a program that best meets your needs. The following list of master’s and doctoral programs are presented in no particular order, and we’ve made no attempt at ranking them. Instead, we’ve provided what we think are the most relevant points about each program so that you can make a well-informed decision on your own. Master’s and PhD programs are listed separately and some schools on our list offer both. To give you the full picture of what each school offers, we included all the ABAI-BAAB accredited programs within the department. BehaviorAnalysis@Simmons - MS in Behavior Analysis online. No GRE required. BACB®-Verified Course Sequence. 3.0 GPA strongly preferred. Pepperdine University - Online Master's in Applied Behavior Analysis. GRE scores are not required to apply. University of Dayton's - Online Master of Applied Behavior Analysis program. No GRE required. Jacksonville State University prepares students through not only instruction and training, but also through a variety of research opportunities. Our favorite thing about this program is the university’s animal and human research facilities, offering a unique educational experience that is hard to come by anywhere else. Top-performing students of this program receive funding in the form of graduate assistantships and hourly pay in a number of practicum settings. Students in the MS in Counseling program at California State University are well-prepared to take on jobs as behavioral consultants, case managers, or behavior analysts in a wide variety of settings. Students have the option of taking a comprehensive final examination or completing an original research thesis to round out their master’s program. It’s all about choices. Florida Institute of Technology offers four different master’s level programs in ABA, all of which are designed to produce competent ABA practitioners and consultants qualified to take the BCBA certification exam. Florida Tech is ranked second in the world for its number of publications in the Journal of Applied Behavior Analysis, making this a school that not only produces highly qualified graduates but one that also contributes significantly to the body of ABA literature. One of the most unique things about Florida State University’s ABA master’s degree program is that all students receive assistantships and tuition waivers by being placed in certain approved ABA agencies in high needs areas. This program culminates in a comprehensive examination and the completion of a professional portfolio. The MA in Applied Behavior Analysis through University of South Florida is offered online while the MS program is offered exclusively on-campus. These are entirely separate programs, but both meet the eligibility requirements for taking the BACB’s BCBA certification exam. These options offer alternatives designed to meet the needs of both full-time students able to attend class during normal hours and non-traditional students holding down jobs while they work toward earning their master’s in ABA. Both programs require at least 1,000 hours of supervised experiences; on-campus students often complete practicums available throughout the Tampa Bay area. The MS in Behavioral Analysis program is delivered as a campus-based program, as well as a blended/weekend program for students living in the Chicago area. We feel there is nothing better than flexibility when it comes to your education options, especially when you’re trying to juggle a busy schedule. Graduates of this program are well-prepared for careers working with children and adult patients who have developmental disabilities and chronic medical conditions. The Master of Arts in Applied Behavioral Science through University of Kansas trains researchers and scientist-practitioners to solve human behavior problems, including those related to autism spectrum disorder. This program includes supervised experiences focused on the conceptual foundations of behavioral science and culminates in a master’s thesis. Students of McNeese State University have the option of completing the Master of Psychology with a concentration in ABA as an on-campus or online program. Nearly 80 percent of all students of this program receive a graduate assistantship to make covering the cost of education more manageable. All students enrolled in the on-campus program will be placed in an internship position through the McNeese Autism program. The MA in Applied Behavior Analysis features a partnership with the Kennedy Krieger Institute’s Department of Behavioral Psychology. Instead of a master’s thesis, the MA in ABA requires students to complete a full behavioral intervention, providing a unique learning experience that no thesis paper can compare to. The Institute for Behavioral Studies in the Van Loan School at Endicott College turned out its first graduating class of educators trained in the art and science of ABA in the spring of 2017. Though Endicott doesn’t currently hold ABAI-BAAB accreditation, when you consider the amazing faculty and the fact that the school offers more specialized program options for teachers interested in studying ABA than almost anybody else, it’s no wonder why we couldn’t help but include them on this list. We love the fact that Simmons College’s Department of Behavior Analysis houses both an MS for general practitioners and an EdS for educators. Students in these programs graduate with everything they need to excel in careers ranging from instructional design and special education (EdS program graduates) to organizational behavior management, behavioral medicine and even animal training (MS program graduates). Students in these programs will gain practical experience at an approved site as part of Simmons’ unique mentoring program—at least 10 hours a week for a total of at least 750 work hours. It’s no surprise that graduates report a first time pass rate of 80% on the BCBA exam compared to the national average of just 65%. The MS in Clinical Behavioral Psychology through Eastern Michigan University prepares students not only for the BCBA exam, but for licensure and clinical practice as a Limited License Psychologist (LLP) in the state of Michigan. All students will participate in a 500-hour field practicum as part of this program. The MA in Behavior Analysis through Western Michigan University prepares students for doctoral work or for careers in community mental health and government, or in areas like I/O behavioral management in business and industrial settings, among others. Just some of the research facilities available to students include non-human behavior labs, child and adult studies labs, organizational behavior management labs, and physiological research facilities, providing students with unparalleled exposure to ABA in practice. St. Cloud University’s MS in ABA is offered as both an on-campus and online program, providing an option that suits the needs of traditional and non-traditional students alike. The success of this program is evident, as this university has the highest BCBA pass rate of any online ABA program. Many graduates go on to enjoy successful careers treating individuals with autism and other developmental, cognitive and behavioral disorders. Applied behavior analysis with a social conscious is at the heart of Saint Louis University’s ABA graduate program options. In fact, SLU holds the distinction of having the only ABA program in the nation housed within a school of social work. The university is also the first in the nation to offer a Master of Social Work with an ABA concentration. Though this program has not elected to pursue ABAI-BAAB accreditation, we felt these unique attributes made it deserving of an honorable mention here on our list of top grad programs. Graduates of the MA in Psychology with Behavior Analysis concentration pursue careers in education and mental health settings, as well as in business and industry in unique niche areas like industrial organizational behavior management. The programs are delivered using a unique junior-colleague model, and focus on behaviorism, basic and applied research in human behavior, basic research in animal behavior, and instructional design and technology. Students choosing Caldwell University’s MA or combined BA/MA in ABA often pursue careers in special education, developmental services, and mental health services. We love the fact that Caldwell offers options with ABA undergraduate students in mind, providing a fast-track to earning a master’s and qualifying to take the BCBA exam. Both programs culminate in an original research thesis focused on their chosen area of ABA. The Teachers College of Columbia University offers a master’s in ABA, which prepares students to not only become certified educators capable of working with early learners from birth to age 6 in New York State, but also prepares them for BCBA certification. Students of this unique program attend classes in the evening while participating in paid internships during the day. The Master of Arts in Educational Studies prepares students to work with adults and children with ASD as well as other behavioral and cognitive disorders. Graduates are also eligible to earn a teaching license and bring the important skills they develop in this program to the classroom, in addition to meeting the course requirements for BCBA certification. The EdS in School Psychology is a specialist-level master’s program that includes two years of full-time study, followed by a 10-month, full-time internship in a school setting. No thesis is required for this program; instead, students complete an internship professional practice portfolio. The University of Cincinnati’s Master of Education in Foundations in Behavior Analysis prepares students with a foundational education in ABA, education, and psychology applicable to working in the classroom and beyond. Graduates of this online program practice in schools and other agencies where they often work with children with autism and other behavioral disorders. Students can complete this program is as little as five semesters (20 months) through a 100% online format. The MA in Behavior Analysis through University of Houston is a unique research-based program that is also focused on producing practitioners capable of providing therapeutic services for those with developmental disabilities. Students complete a variety of hands-on practicum and research experiences in home, school, and clinical settings, including the Center for Autism and Developmental Disabilities. All students complete a major research project before graduating. As the very first program in the nation to earn ABAI accreditation, the MS in Behavior Analysis through University of North Texas has earned a reputation as a stellar academic program and has attracted students from all over the world. This program includes a variety of research opportunities, including the Behavior Research Laboratory and the Behavior Analysis Online Research Group. Oslo Akershus University’s Master’s in Learning and Complex Systems program prepares students to become skilled ABA practitioners and managers. Oslo Akershus University is the largest state college in Norway and welcomes many international students each year, including several from the Untied States. Here’s your chance to study aboard and bring a global perspective to your ABA practice. The PhD in Behavior Analysis through Florida Institute of Technology is designed to produce behavior-analytic researchers, practitioners, and instructors. Graduates of these programs often pursue academic positions and continue active research programs that are vital to improving the understanding of behavioral disorders and what therapies are proving to be most effective. A dissertation must be presented and defended as a requirement for graduation. The PhD in Applied Behavior Analysis is a research-intensive program that includes literature reviews and a dissertation in an environment where faculty provide supervision and mentorship, fostering a deep understanding of applied behavior analysis and treatment evaluation in action. Students will get a chance to make a meaningful contribution to the body of research and literature by presenting their research at meetings of the Florida Association for Behavior Analysis and the Association for Behavior Analysis International, working with faculty mentors to have their work published. Students will also participate in mentored and independent teaching experiences, both in-class and online. Southern Illinois’ PhD in Rehabilitation with a specialization in behavior analysis has a long history of student-centered research. Doctoral students work closely with a faculty member in behavior analysis who will also serve as their academic advisor and chair to their dissertation committee. This unique professor-student collaboration is so fundamental to the structure of this program that upon enrollment students are expected to specify which professors they wish to work with and are ultimately selected for the program on the basis of how well their strengths and goals align with those professors. The PhD in Behavioral Psychology through University of Kansas prepares students to become highly competent researchers in the field of ABA. The curriculum of this program includes training in applied, basic, and intervention research and operates according to a junior-colleague model that provides a unique mentorship experience for students. Students of the program conduct in-depth research and prepare manuscripts for presentation and publication. Endicott has applied for ABAI-BAAB accreditation, and will soon be counted among the short list of schools with an accredited ABA PhD program. A rare distinction that earned this program a place on our list a little early. This research-based doctorate will give you the educational qualifications for the esteemed BCBA-D credential and prepare you to make real contributions to the field of ABA. Western New England University’s PhD in Behavior Analysis is a world-renowned program that was designed in response to an increasing demand for scientists and practitioners skilled in treating individuals with autism and related disabilities. This program includes both coursework and supervised practical and research experiences. One of the things that make this program special is the partnership the College of Arts and Sciences maintains with the prestigious New England Center for Children, a school with more than 250 children with autism and a faculty of more than 1,000 teachers. The PhD in Behavior Analysis through Western Michigan University produces graduates that go on to become leaders in every area behavior analysis is applied – everything from teaching and research positions at a college or university, to professional positions in industrial/organizational behavior management in business and industry, to systems-oriented work in the area of human services. This program is research-intensive, with students spending much of their time working alongside faculty members to receive the kind of mentorship and immediate feedback that would be hard to find in other programs. University of Nebraska Medical Center’s Munroe-Meyer Institute prepares students through a program that encourages independent study, investigation, and research in ABA. Graduates go on to assume leadership positions in clinical, research, and academic settings. This ABA doctoral program is the only one in the state of Nebraska. This alone makes it a groundbreaking program in its own right, but add to that the fact that it’s the first in the nation to become integrated with a University Center of Excellence on Developmental Disabilities (UCEDD) to serve as an intermediary between the academic community and the public, and you know you have something really special. The PhD in Behavior Analysis through University of Nevada’s Department of Psychology balances basic, applied and theoretical training in ABA. This program follows a junior-colleague model to put doctoral students and experienced professors together in a way that encourages mentorship and collaboration through supervised experience and training designed to teach theory and methodology of behavior analysis, basic and applied research in human behavior, and the philosophies of behaviorism. The PhD in Applied Behavior Analysis through Caldwell University is designed to prepare students for success in high-demand areas like special education, mental health, and academia. Students will develop research skills and learn how to present their findings in a way that can be used to contribute to the body of ABA literature through a dissertation research study written in American Psychological Association (APA) format. The PhD in Teaching as ABA through Columbia University Teachers College builds on master’s-level research to provide you with a deep understanding of how ABA principles can be used to create the most inclusive and effective learning environment possible for children with ASD and other developmental and cognitive disorders. The program culminates in a dissertation designed to identify and investigate a topic related to the mission of the program. Your dissertation will give you an opportunity to contribute research to both the applied and basic sciences. The PhD in Educational Studies, Special Education through Ohio State University is designed to prepare graduates for careers in research and teaching. Students of this program will develop competencies that will prepare them to conduct applied research, contribute literature on public education, teach at the college level, and serve the community. The PhD in School Psychology through University of Cincinnati is comprised of three years of coursework and integrative field experiences, along with a ten-month, full-time internship of at least 1,500 hours. This provides the perfect combination of didactic and experiential learning. Students of this program prepare to become highly competent school psychologists, making significant contributions through practice, research, professional leadership, teaching, and supervision. West Virginia University’s PhD in Behavior Analysis prepares graduates to take on positions in academia and applied practice with a focus on basic research, theory, along with an understanding of how the principles of ABA are applied in clinical practice. Students study both experimental and applied analysis, with many graduates going on to contribute to developing new behavioral change technology – everything from interactive software to wearable technology used to improve health and quality of life. While the curriculum consists of basic, conceptual, and applied areas of ABA, students may choose to focus on either basic or applied research. Note: Student-to-faculty ratios represent the institution as a whole, not the featured program. Tuition and related fees do not take into account any type of financial aid you may qualify for, and books and related expenses are not included in the total. In instances where ABA was offered as an area of focus within a psychology or education program, the institution provided the total number of graduates within those majors.